Shortly after this article was published, Possman and his wife founded Predators Unlimited, possibly because they decided that the real money is in tigers and lions instead of alligators. 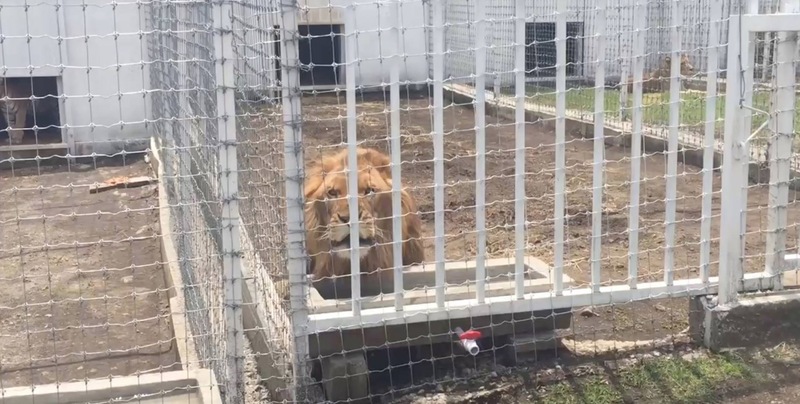 The “sanctuary”/ business is run from the Possman’s backyard, where a menagerie of exotics, including tigers, lions, leopards, bobcats, wolves, primates, and even a Florida Panther live in ramshackle cages. It’s kind of scary, especially because the Possmans have young children (who are apparently encouraged to help “socialize” wolves). Yikes! Like most exotic animal exploiters, the Possmans believe that it is their right to do whatever they want with exotic cats, and are good friends and allies of some of the worst abusers. There’s a photo of Grisel visiting her friend, Josip Marcan, whom she appears to have bought a tiger cub from. Grisel also has movie big cat owner/trainer Randy Miller and circus exploiter Felicia Frisco as “friends” on Facebook, and, along with her husband, “likes” a Facebook Group called “Big Cat Rescue Scam”, where big cat exploiters go to find distorted “proof” in their attempts to discredit Big Cat Rescue (I guess they must not have anything good to say about their own practices). 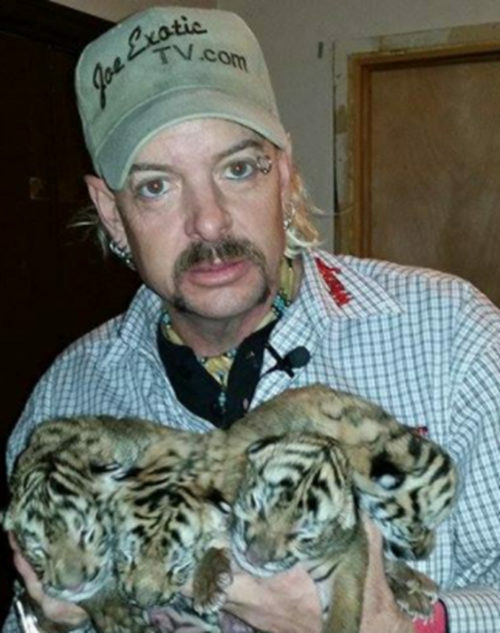 The Facebook page of a Possman family member and full-time employee of Predators Unlimited shows that she is “friends” with Joe Schreibvogel Maldonado, John Molnar (of Nevada’s infamous “Lion Habitat Ranch”), Vera Chaples of “Mystic Jungle”, and a wide variety of big cat “trainers”, owners, breeders, and “advocacy groups” which push for looser laws regarding their “property”. This particular employee’s main interests seem to be concealed weapons, racism, nonsense rants against the Humane Society/state agriculture departments/common-sense exotic animal laws, and hating Big Cat Rescue (because apparently, in his mind, selling coffee mugs with pictures of big cat “art” created during enrichment is “exploitation”, while locking a tiger in a cage and renting it out to a nightclub isn’t). Predators Unlimited’s “claim to fame” is their willingness to provide exotic animals as props for virtually any occasion. According to their website: “This includes but is not limited to special events, birthday parties, weddings, corporate events, photoshoots, any film work, and any other social event you might have.” They contract with two Orlando-area event rental companies to do this, which I will go into more detail on later. While at an event, adult big cats are simply left in their tiny transport cages as a living “decoration”. For example, on August 16, 2015, an African Lion named Noah was rented as a party prop by Yehudi, a Jewish young professional’s network in Miami Beach. The party was called “Lions and Lemonade”, and Noah was the star attraction. Here is a video taken at the event, which shows the incredibly stressed-out lion panting and growling in his tiny cage. Predators Unlimited also brought a caged golden tiger and baby cougars to a noisy album release party for rapper 2Chainz and his massive ego. The frightened animals were brought to Compound nightclub, where they were exposed to blasting music, bright lights, cigarette (and who knows what else) smoke, and fire. The poor monkey is squirming and trying to escape, while the older big cats look utterly defeated. It’s not just big cats that are used as props, either — Predators Unlimited rents out smaller exotics, like monkeys and lemurs. These usually used as props, but sometimes, if they’re hired for parties or petting zoos, they’re passed from guest to guest to be petted and posed with — whether the animal wants to or not. I’m no expert on primates, but it looks to me like Toby, their capuchin monkey, has had his canine teeth filed down to lessen the damage from a bite. This mutilation is extremely painful, but common among exploiters who want to make their animals “safe” for public contact. Predators Unlimited regularly provides live exotics for photo shoots, commercials, TV, movies, and music videos. According to their website, their animals have appeared in C.S.I Miami, Dexter, Law & Order, and, ironically, Fatal Attractions. Oh, and that “elephant appreciation event” was billed as a “fundraiser for elephants” on Predators Unlimited’s Facebook Page. It sounds nice, until you learn that it was a fundraiser for Patricia Zerbini, a retired circus trainer who makes a living renting out elephants to fairs and circuses. The Possmans “drove all the way to Gainesville” with a young African lion and displayed her in a tiny “circus wagon” because they wanted to raise money “for elephants.” Or for the right to pimp out exotic animals for profit. It’s hard to tell. Here’s one of their baby panthers in a Rick Ross music video. And the same one on set for several photo shoots. alligator wrestling, and an exotic animal petting zoo. Because there’s nothing more “educational” than seeing someone stick his head in a tiger’s mouth. (You know I’m being sarcastic, right?) While at fairs, the big cats and other animals that aren’t performing are left “on display” in tiny, barren travel cages for days so that fairgoers can gawk at them (look at the background in these two pictures). Predators Unlimited posts photos of this, saying that the cats are “having fun.” Does this look like “fun” to you? Of all the things Predators Unlimited does, this is by far the scariest. They allow anyone with money to pose with adult (or baby) big cats for photos (remember when Darnell Dockett posed with a tiger? Or Shaquille O’Neal’s family? How about when Jaime Fox had a baby lion brought to his house? That was Predators Unlimited at work). Predators Unlimited provides tigers to Miami-based professional photographer Lopez Falcon, who uses them as props in photo shoots for quinceanaras. This means that teenage girls are allowed to pose next to, or even touching, 650-lb. adult tigers, with nothing more than a handheld chain or metal stake “restraining” them. This isn’t even legal! It’s obviously incredibly dangerous, and if it continues, someone will get seriously hurt or killed. There have already been some extremely close calls. I found this shocking video that Falcon posted about what happened “behind-the-scenes” at one such photo shoot last year. We see Cylon (the same golden tabby used at Tatiana) being led out of his transport carrier on a chain by Jeremy Possman. The massive tiger is brought into a house, where the shoot will take place. Suddenly, Cylon panics and starts desperately running around the set in an attempt to escape. Possman is obviously unable to restrain Cylon as he blindly rushes around the home, destroying equipment and furniture in the process (and sending staff running). Eventually, Possman and the photograph staff use furniture to herd the frightened cat back onto his “mark.” Possman gives Cylon’s rump a swat, and the cat finally gives up and lies down, ears pinned back in fear. Predators Unlimited has a pretty consistent menagerie, so it’s fairly easy to tell which individual cat is used where and when. This is not a complete list, but it does cover many of Predators Unlimited’s most frequently exploited big cats. The Possmans like to acquire their animals at a young age so that they can hand-raise them. From the moment a cub is bought by Predators Unlimited, we believe his or her life becomes nothing but exploitation. A good example of this is Zeus, the Florida Panther. In 2012, Zeus was born at an unknown breeder. When he was just six weeks old, in November, he was sold to the Possmans, where he was treated as a housepet. Sometimes, when Zeus wasn’t being cuddled, the Possmans staked the tiny cub to the ground to prepare him for a lifetime of exploitation. A few weeks later, little Zeus found himself being literally dragged by his leash to a charity event, where Predator’s Unlimited was hired to do an “educational show”. By Christmas, the cub was being carted across the country to be used as a prop at photo shoots and music videos (which I showed you earlier). He was even snuck into a New York hotel! As Zeus grew, the Possmans continued to exploit him by displaying his cage at fairs. When he became large enough to hurt someone at about one year of age, trainers holding sticks started to “work with him”, likely in the hopes that he’ll become a “showbiz animal”. He was also seen chained to the ground in the Possman’s backyard. Zeus still makes appearances at fairs. Noah is one of the Possman’s male African Lions, and is easily one of their most exploited animals. He was used at the Yehudi party I mentioned earlier, and was also used in fairground shows. Like Zeus, Noah was acquired (and chained to the ground) at a young age. 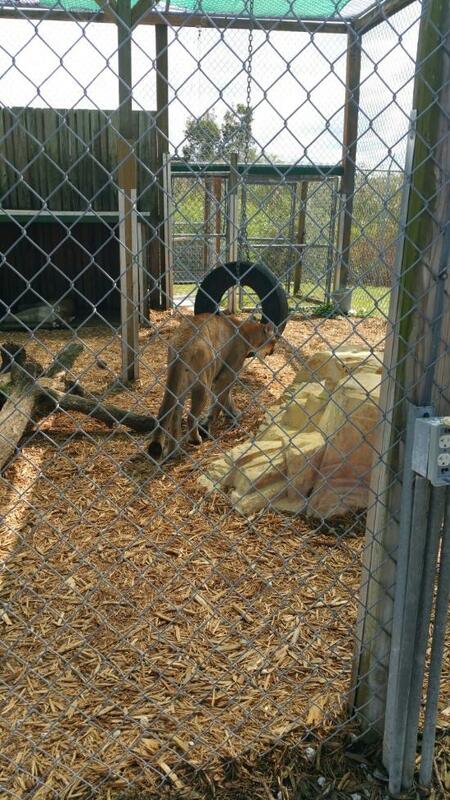 Here is a picture of Noah as a juvenile in his backyard enclosure. In 2010, Noah was rented out to a church, where he was used as a prop in a sermon. Noah was chained up inside a tiny transport cage and placed on the pulpit the night before the sermon. During rehearsals, pictures and images of lions were displayed on screens in the room, and, according to the pastor, “he didn’t like that”. The next day, during the real sermon, witnesses claim that Noah was pacing neurotically back and forth the entire time. Noah is used at many, many events, usually as a display animal. Cylon is a male “golden tabby” tiger, and another one of the most frequently abused. The Possmans acquired him as a cub sometime before 2011, when this photo was taken. In 2012, Cylon was displayed in a small cage during a cruel animal “exhibit” held at AllPets Emporium, a pet megastore in Pembroke Pines. The large sores on Cylon’s elbows and nose suggest that he had spent a lot of time in that cage. And maybe it’s just the angle of this picture, but he looked a little skinny, too. Aries is a white tiger who appears to have been purchased from Josip Marcan as a cub sometime in 2012. You can tell him apart from the Possman’s other white tiger because his stripes are much fainter. Aries quickly became a favorite photo prop among the Possmans, and is used as a performing cat at fairs. He was also rented out to Tatiana. Saber is a male “standard” tiger. He was raised in the Possman’s home as a cub. Later, he was staked to the ground to take photos with Darnell Dockett and Shaquille O’Neal. Saber is used for commercial photo work and as a fairground display. He also made appearances at Tatiana. While Predators Unlimited does own intact tigers of both sexes, Jeremy Possman claims that he does not breed his cats. The Possmans seem to be the type of people who would brag about breeding if they did, and since I couldn’t find many “cub photos” on their websites, I find this claim believable. But, their most recent USDA inspection, from September 2015, notes that they now have 10 tigers. And Predators Unlimited has often been seen bringing tiny tiger cubs to events as photo and petting props. We know that Predators Unlimited won’t hesitate to exploit cubs they already own (here’s a picture of a baby lion on display at the pet store). And, just 3 months ago, an employee/family member of Predators Unlimited posted this video of her showing off two screaming 4-week-old tiger cubs to her friends. It’s possible that the cubs in the video are the same ones in the “petting zoo” photo I linked to earlier. But where did they come from? I don’t think these cubs were born at Predators Unlimited. The Possmans are good friends with other private owners/breeders, and there are a lot of them in Florida. My best guess is that Predators Unlimited buys cubs off of other breeders. 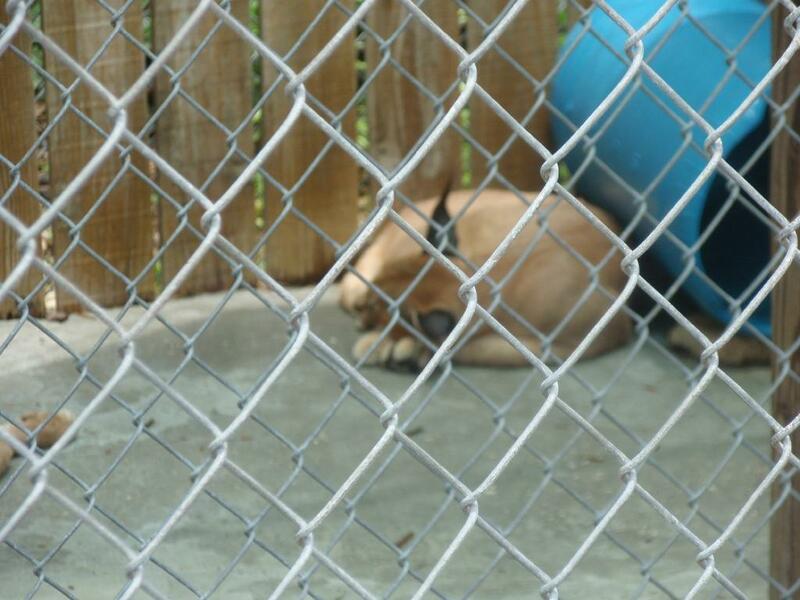 These photos from spring 2014 show a Predators Unlimited employee and her family at what appears to be a backyard breeder (plywood walls, rusty cages, the whole lot). She’s holding tiger cubs that are just days old. Regardless of where these cubs came from, the orange one was named Raja. Raja was sick as a cub — you can see sores on his nose and eyes in this photo. His owners mention that he “had a little issue”, but “is doing better” in the comments of this photo. The only bright side to this is that Predators Unlimited doesn’t “discard” growing cubs like other facilities do — once they buy a cub, they’ll usually keep it (and exploit it) for life. I used Google Earth’s surprisingly accurate “ruler” feature (I tested it on some sports fields and got the right dimensions) to get a rough idea of how large some of the enclosures are. 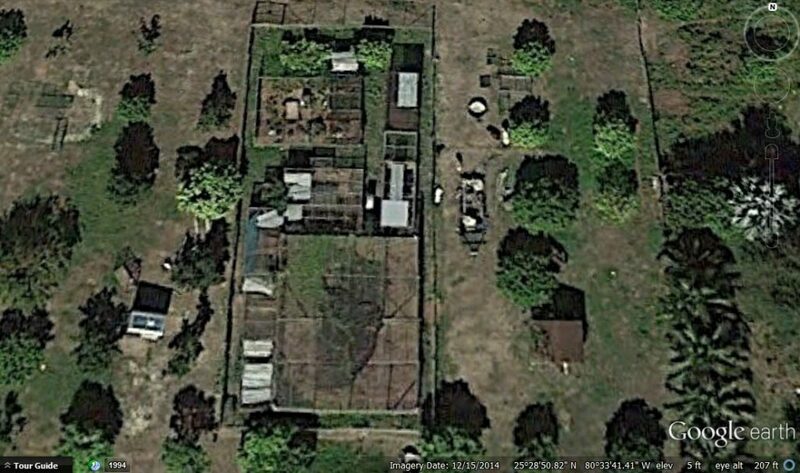 The largest enclosure on the Possman’s property, which I believe is home to several tigers, measures roughly 2,397 square feet — which is slightly smaller than a regulation doubles tennis court. Other photos, although they are older, show concrete flooring in at least part of some enclosures. Fortunately, the larger enclosures do have a mulch substrate, as well as some platforms and perches for the cats, which is better than some backyard owners can manage. Interestingly, Google Earth has cached photos from the same spot going back to 1994. I reviewed them, and discovered that there were no animal enclosures on the property at all until late 2007, suggesting that Predators Unlimited was created as a money-making venture (and not just by existing exotics owners who decided they could make a quick buck off of their “pets.”) And, just over the past year alone, 6 smaller cages have popped up in the Possman’s backyard as they acquire more animals. I looked into Predators Unlimited’s USDA inspection reports (their license # is 58-C-0899). I was unable to find very much new information. The inspectors are unable to find anything either, because the Possmans have gotten very good at dodging them. In recent years, inspectors arriving at the facility haven’t been able to find anyone available to do the inspection. It’s gotten to the point where the USDA has been attempting inspections once a month (which is extremely often for them). No dice. In one case, the inspector called Possman’s cell phone, only to be told that “he was away” and “didn’t know when he’d be back”. In November 2014, the inspector called, and was told that, because the Possmans had a court appearance, nobody would be home. They then suggested that early mornings or late afternoons would be “the best times for inspections.” It almost seems like Predators Unlimited is trying to keep federal inspectors away from their facility… but why? at least have some enrichment items in them (too bad their Fennec Fox and Caracal can’t say the same). And look what they’re “teaching” the public about wildlife — that baby bobcats are cuddly little cats to put on a leash and play with. 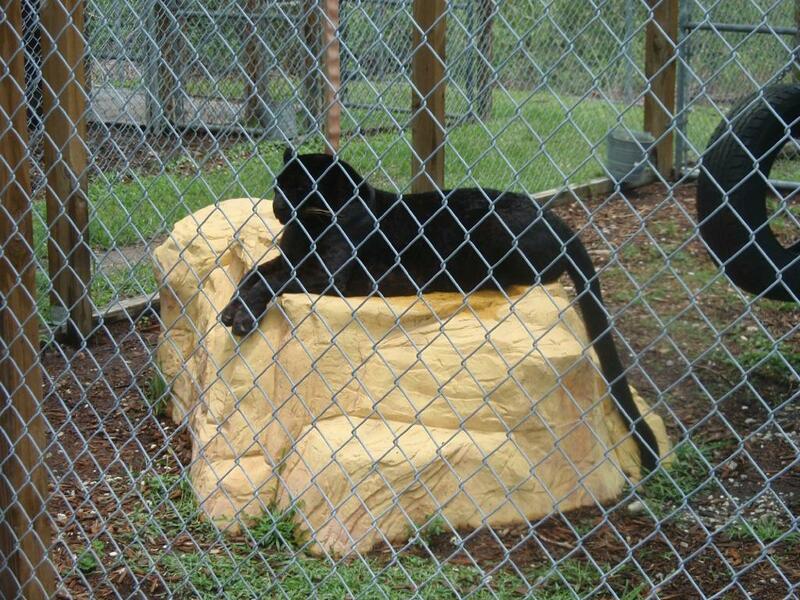 Also, this is probably why the panther enclosure was muddy in one of the inspection reports. Their affiliates: the photographers and venues which hire their animals as props, and especially the party rental businesses which “rent out” Predators Unlimited’s big cats to anyone who can pay for them, should be educated as to why this is so wrong. It’s disgusting, but these businesses allow people to rent a live tiger or lion like they would an inflatable bounce house. These rental brokers are the primary driver of Predators Unlimited’s business, so if we can convince them to stop offering live animals as “rentals”, it should deal a huge blow to big cat exploitation in Florida. There are two big party rental businesses that contract with Predators Unlimited to rent out big cats. They are Xtreme Event Rentals, owned by Brian Baird, and No Limit Event Rentals, owned by Greg Miller. Greg Miller appears to be a good friend of the Possmans, and his “No Limit Event Rentals” claims to be “the best place for bounce house rentals in Orlando.” But when he isn’t renting inflatables, rock walls, and carnival games, he brokers Predators Unlimited’s big cats and other animals for events, and rents out their cubs for petting props. And he contracts with other exhibitors, too, so that he can offer live elephants, zebras, and giraffes as party props. I guess you could say there’s “no limit” to the animals he’ll exploit. No Limit Event Rentals is a major supporter of Predators Unlimited. Contact them here. Contact Xtreme Entertainment at rentals@party-rentals-orlando.com. You can also use this online form. Lopez Falcon, the photographer who risks lives by using Predators Unlimited’s tigers for photo shoots with teenagers, can be contacted at lopez_falcon@yahoo.com, and/or via this online form. The Secret Gardens in Miami is an event venue that offers “exotic animal life rentals”, including tiger cubs, for use as props. It’s where Lopez Falcon does many of his tiger photo shoots. And guess where the animals come from? Well, I can’t prove they’re from Predators Unlimited, but the Secret Gardens is very close to the Possman’s facility, and any facility that rents tiger cubs is worth contacting, anyways. Contact them here. Note the Predators Unlimited staff slapping the cub and jerking him around by his leash. Whenever you see the nose scuffed up, like this poor little tiger cub, you know that they are kept in tiny cages where they pace constantly and rub the fur off their nose. Whenever you see the washed out color, like this little cub, you know that the owners have purposely inbred their tigers, trying to create odd color morphs that ignorant people will pay to see and pet. Xtreme Entertainment brokers events with these kinds of operations. USDA citations for not allowing inspection of facility, not allowing inspection at venue, dangerous, dilapidated cages and a hole in the bobcat cage big enough for the alligators next door to get through. Is this the kind of thing you want associated with your business? a leash or out and about.